“Vikaari” rooms have Waystones teleporting to another location; the room name specifies the destination. (E.g. 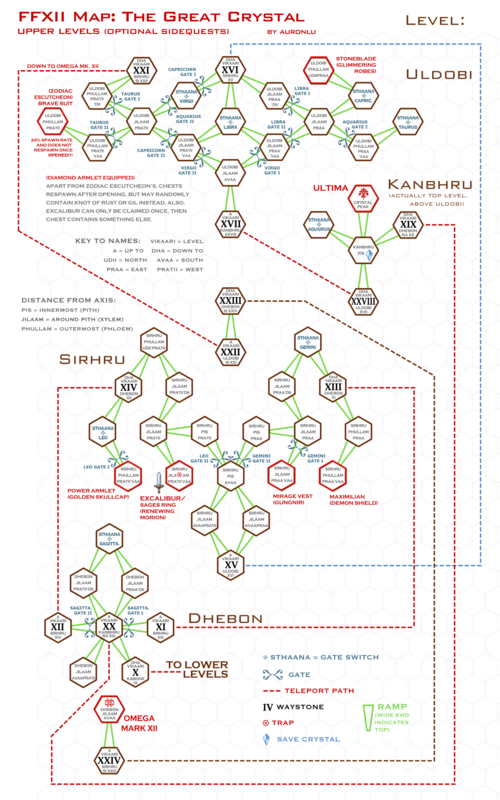 “A Vikaari Bhrum” means “up to level Bhrum,” while “Dha Vikaari Trahk” means “down to level Trakh.”) Nearly every Waystone moves you exactly one level up or down. 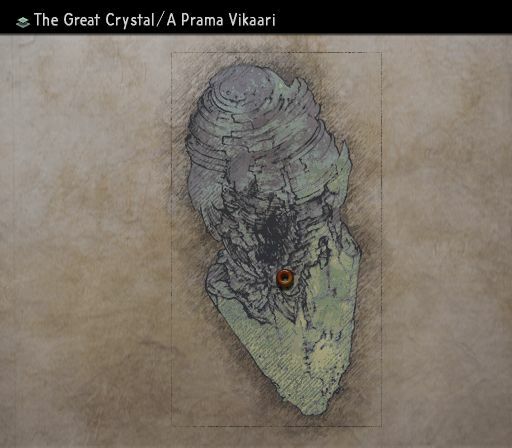 So if I said I was in “Trakh Phullam Pratii’vaa,” that would mean I’m in a room near the bottom, close to the outer edge of the crystal on the southwest side. To view your current location/room name in the Great Crystal, hit Select and look at the label at the top. Click HERE to see a full-sized version; the image below is shrunk to fit. Shortcut to Exit: Once you’ve played through the plot at Giruvegan, the elaborate-looking Waystone in the “Goal” room will teleport you straight out of Giruvegan, bypassing the dungeon surrounding the Great Crystal. 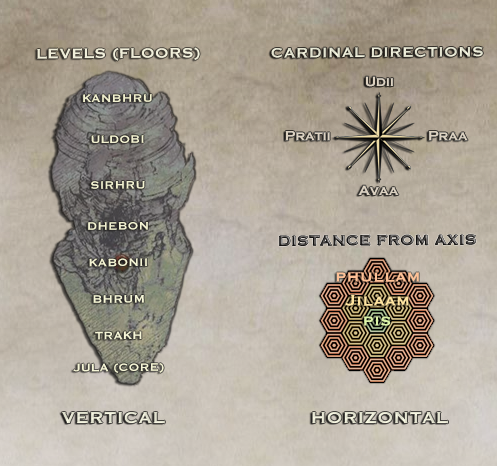 SHORTCUT from top to bottom: Look for XIX on the Kanbhru level at the very top. That Waystone teleports you all the way back down to Dhebon. THE WAY OUT: Go down to Dhebon’s Waystone X, teleport from there to Kabonii Waystone IX, walk to the adjacent room and use Waystone VIII to exit the Great Crystal. Don’t put the Diamond Armlet on for the lower four levels (Map I), because it makes everything down there a Knot of Rust. But not to worry if you forget; those chests respawn until you find their special item. DO put the Diamond Armlet on for the upper four levels (Map II). It raises your chance of snagging a good item. All the upper level chests respawn with ONE exception. Whatever you do, don’t open the Zodiac Escutcheon’s chest unless you’re wearing Diamond Armlet. This chest does NOT respawn once opened. Chests respawn after you move three rooms away. As far as I can tell, the names in the Great Crystal are pseudo-Sanskrit or scientific names spelled as if they were Sanskrit. I mentioned the plant parts (Pis = Pith, Jilaam = Xylem, Phullam = Phloem) above. I’m not sure whether the rash of Sanskrit in FFXII was inspired by Sanskrit’s use in some old-fashioned Japanese Buddhist sects, similar to Latin’s use in the west, or whether it’s just that Squeenix is continually mining various world mythologies and cultures in order to name these games’ endless parade of places, critters and things. This entry was posted in tips & game guides and tagged crystal, dungeon of shiny, ffxii, map, sidequests before saving the world. Bookmark the permalink.